Amp courtesy of Marcel Cavallé. Photos by Andrea Nieto. 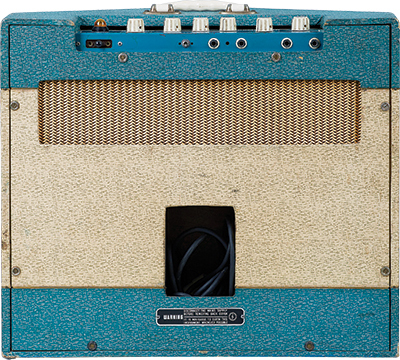 Is there any more stylish vintage amp than the V-front Watkins Dominator? This creation is delightfully twee yet utterly enticing – the allure of its blue-and-cream Rexine covering, gold-threaded grillecloth, and thrusting wedge aesthetics virtually irresistible – and it screams from an age when rock and roll was barely a big-stage event in Britain. 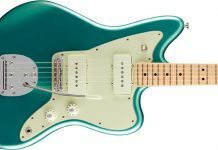 Looks aside, the Dominator was the flagship of a pioneering maker who, like Leo Fender in California a few years earlier, was one of the first to address the needs of a new breed of guitarist. 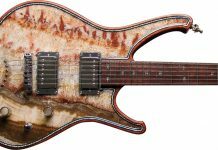 And if the industry was on the cusp of a revolution, guitarists still owed thanks to Watkins for helping them reach this point. The Dominator’s twin 10″ Elac speakers are mounted on individual baffles, aimed outward for broader sound dispersion. The first Watkins amps were built by local electronics jobbers. Like many others of the day, they were able to run on domestic AC or DC current; if used incorrectly, however, they could be extremely dangerous, even deadly. 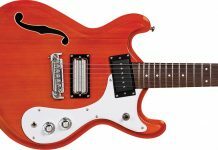 The scare put Watkins off the amplifier game for a time, but the need remained for a reliable (and louder) electric guitar, as one skiffle musician after another kept coming to the Balham shop. 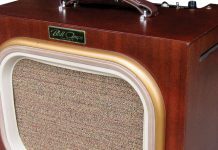 Watkins returned to the venture in the mid ’50s by commissioning an AC-powered combo sold as the Westminster, which generated about 10 watts through a single 10″ Elac speaker. For ’56, the Westminster was briefly given a larger V-front cabinet, but by ’57 that format was exclusive to the new Dominator (the Westminster having returned to a more-standard rectangular cab). 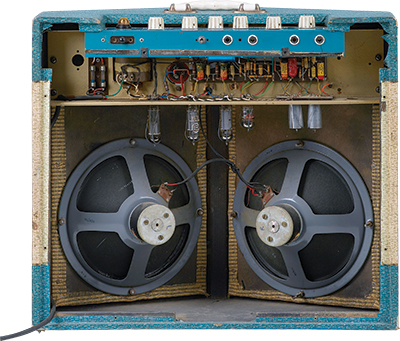 The new Dominator had two 10″ Elac speakers angled outward for enhanced dispersion, two channels – one for microphone, one for guitar (with tremolo), and a pair of EL84 output tubes to generate 17 watts – as much as a guitarist was likely to need at the time. 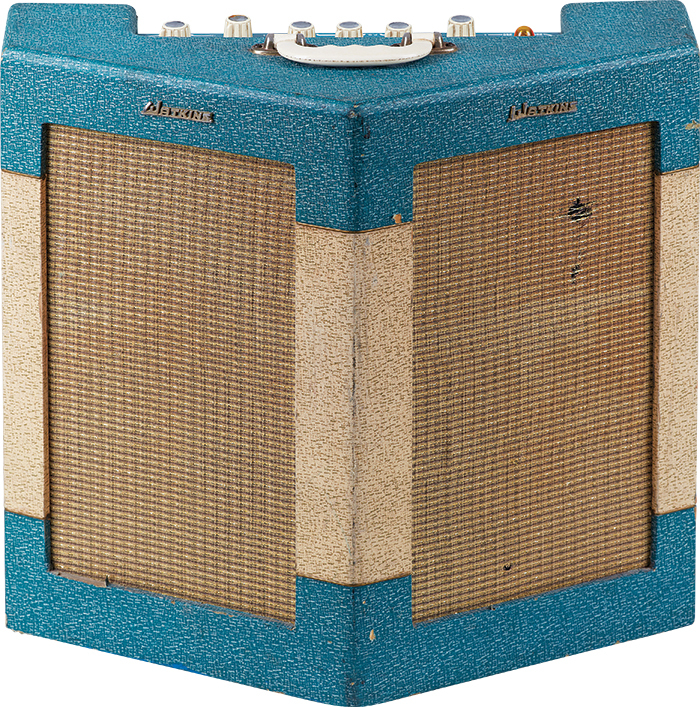 Watkins’ amps were generally more rough-hewn than those from competitors like Vox, Selmer, and (soon) Marshall, but a look inside this Dominator reveals it’s rather nicely put together. 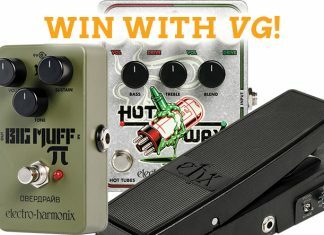 Components include a handful of the “mustard caps” enthusiasts drool over in vintage Vox and Marshall amps, while other parts are generally of good quality. 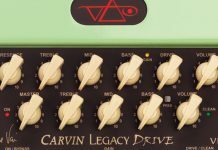 Charlie Watkins’ desire to save a penny is well-documented, though, and a budget-friendly production ethos is evident; the main circuit board is an early printed type (PCB), and the first two preamp tubes are loaded onto their own printed board. Make no mistake, though, this is still very much a hand-wired amp; its components are in line with those employed by makers using turret and tag boards. Owner Marcel Cavallé tells us the amp has a truly British sound. The V-front baffles do throw sound at an impressively wide angle, though there can also be a gap in its soundstage directly in front. Cavallé had the large filter caps replaced and installed some new tubes. The footswitch jack has been replaced by a toggle, for ease of selecting the tremolo effect. Otherwise, this beauty is delightfully original and impressively clean. A couple years after its creation, Charlie Watkins removed his surname from the amps in favor of the acronym WEM – Watkins Electronic Music – which he felt more closely resembled the popular Vox logo. 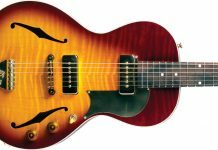 Around the same time, Watkins moved the Dominator into a more-sedate rectangular cab and would eventually remove tremolo from its feature set. Into the ’70s, iterations of WEM’s cornerstone amp remained good-sounding, fun, and today are reasonably affordable. None, however, are as collectible as the stunning, angular original. Its early-style printed circuit board is impressively clean and original. The Dominator’s control panel, with inputs along its rear edge for mic and guitar channels (tremolo on the latter). This article originally appeared in VG March 2017 issue. All copyrights are by the author and Vintage Guitar magazine. Unauthorized replication or use is strictly prohibited.